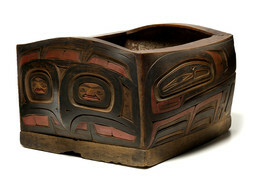 Bentwood bowls were used for storing and serving water, berries, fish, seal grease, and other foods, and hot stones could be added to cook the contents. To make a bowl, the artist shaped and kerfed a hardwood plank, softened it with hot water, bent the corners, and pegged or stitched the ends together. He added a separate bottom piece and sealed the seams with a compound of clamshells, salmon eggs, seal brains, and blood. This bowl has a sculpted face, possibly Raven, at one end; an owl-like spirit face with tail-feathers on the other; and wing designs that extend along both sides.